Marketing Information: The well-built Targus Universal Monitor Stand houses your notebook computer and docking device, saving valuable desk space. It can support an external monitor weighing up to 100 lb, and features a convenient slide out tray for easy access to your notebook. 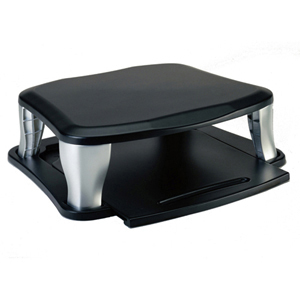 And the Universal Monitor Stand's open architectural design provides quick access to all of your notebook computer's PC Card slots, bays, diskette and DVD/CD-ROM drives.It also allows for convenient storage space on a desk where a hanging cubicle cabinet is present. There is even a 2" riser that will allow you to raise the monitor stand height for larger Port Replicator or docking stations.